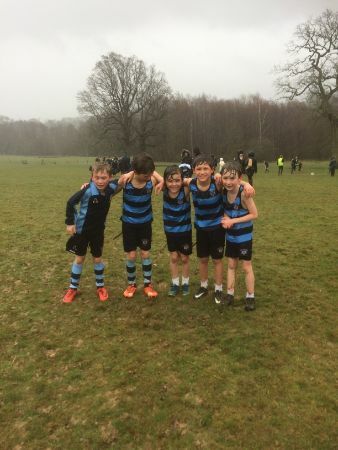 The U9 boys’ team ran superbly to finish third of the eight complete teams, just six points separating first from fourth! It was not a day on which to play tactics; it was purely everyman for himself, a race to the finish and a warm(ish) hoodie. The boys did themselves proud, battling through the wind, rain and mud, Oli H leading them home in a fantastic 3rd place. The Y3 boys are looking good for next year as Freddie F concluded an excellent season in 9th, newcomer Edward S ran superbly in 14th and our little whippet James M completed the team in 19th place. Just behind him, in 22nd, Josh L, another brave little Y3, showed real determination to overcome his horror at what Mrs Fagg was expecting him to do! Well done boys – and sorry that you missed the donuts! !